So this is all of us... my family. It's not very often that we get a photo with all of us in it either. If you look closely, you can see Narnia the pup in her pink cardigan on hubby's lap, and Barney our giant cat falling down the back of the couch (I decided not to include the mice and chickens in our family shot). 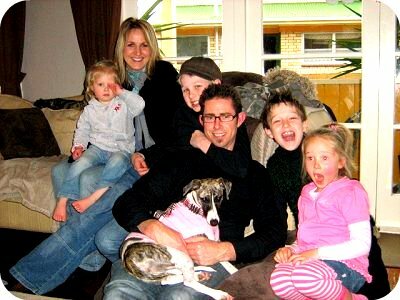 Of course, it's almost impossible to get all 6 of us looking nicely at the camera in one shot, so out of the ones taken, I decided this was the most perfect representation of our family at the moment... Miss 2 is usually grizzling, hubby is usually fussing over the dog, Master 10 is usually hanging around his Dad, and Master 7 and Miss 5 are often found being silly together... and I'm smiling politely. I do love them all (well, maybe not Narnia at times). Beautiful family photo. Love the description of all members. I love it.....and the descriptions too. What is Mykah wearing? My master 2 is usually grizzling too, must be the age! Very good looking family! I love your daughters face in the pic! It was wise to leave the mice out. When my hubby and I had pet mice we tried to include them in a family photo. I don't recommend it. Seriously. You have a lovely family! Hi stinaz81... no I didn't make Narnia's jacket... but I have a few crochet patterns for cute dog jackets... but not enough time to make them at the moment!! great pic! and little Narnia, too cute.